Google Sheets is a collaborative spreadsheet tool that users can access anywhere they have Wi-Fi. Just about anyone can use Google Sheets to make spreadsheets in order to organize their data and other information. 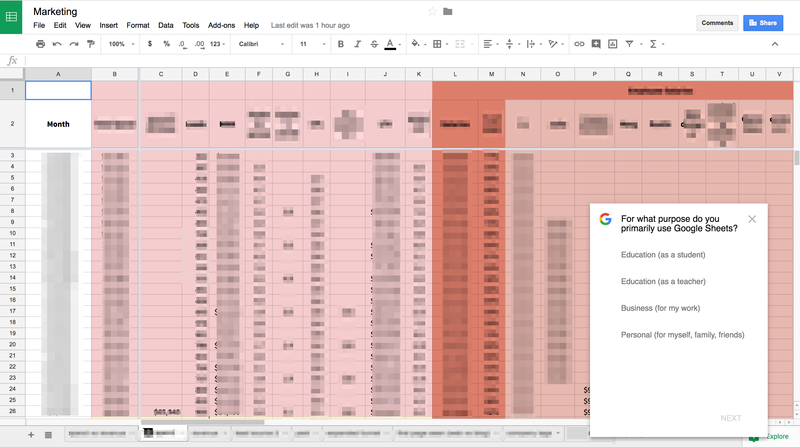 Rather than generalize their NPS survey, Google Sheets requests other relevant information to help organize customer-response data. 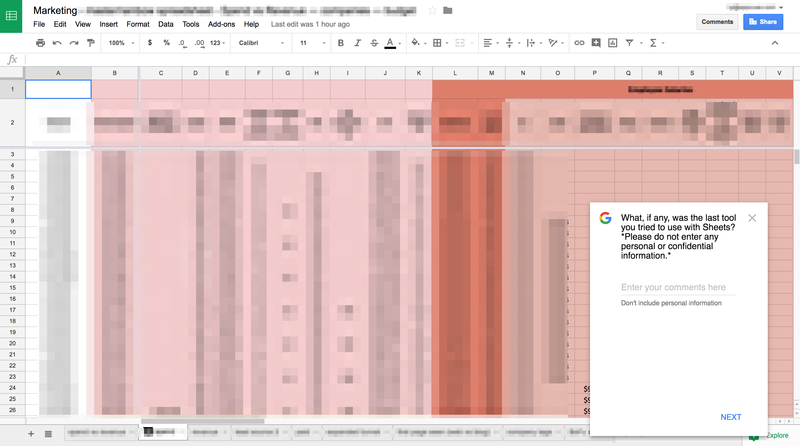 Google Sheets issues this survey in the form of a pop-up box that sits unobtrusively at the bottom right of the screen. The initial question is straightforward and requests factual information so that users don't have to think about the answer. 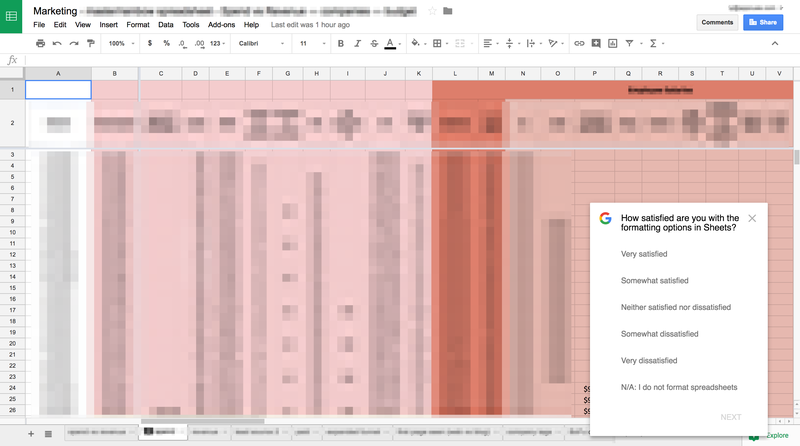 Google Sheets uses two NPS scoring questions to gauge user satisfaction here. One hinges on the speed of the app, while the other inquires about formatting capabilities. Timing these questions while a user is inside the tool (as opposed to in an email) makes this survey a no-brainer because the user might already be thinking about these two functionalities. Leaving an area for open-ended commenting also allows users to expand while allowing others to skip it. 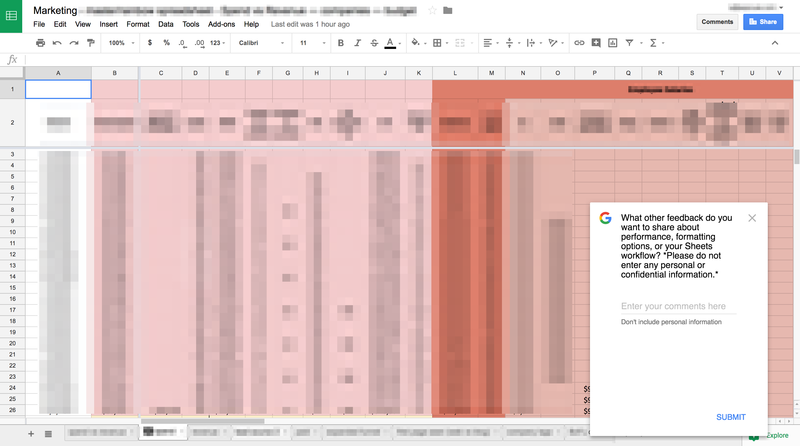 Either way, Google Sheets will gain some insightful data from these well-rounded questions. Evernote collects device-specific NPS feedback to help them learn and optimize its cross-device experience. TurboTax precisely times their requests for feedback and do what they can to make it count while they have the user's attention. To check on their users' satisfaction, Quip pops up a considerate NPS survey at the bottom left of a user's document.